In the early days, my rock moves rocked (and they still do). My swimming instructor, when I was six, got us to line up at the deep end of the 25m pool (it was an indoor pool near where we lived but not our local pool). Being the youngest of the class which also had my nine year old sister, I simply had to do everything first. The instructor told me to touch my toes and as I did so, he pushed me from my backside into the water. I got a snot full of water and choked terribly on my flailing way back to the safety of the side of the pool. Needless to say, I hated swimming lessons. This cat is what I looked like trying to dive into a pool (if the cat was also holding its nose). As a 13year old, I was great at backstroke because I didn’t have to dive (there were very few kids in those days doing back dives). Anything else though, I was well back in the field because I either started in the water or held my nose diving which looked more like a cat trying to resist gravity and going in legs first. The family that lived back to back with us were very much into the local swim club – all their kids were super tall and pretty much built to swim. Their mum, Joan, was the swim club treasurer but like my mum, Joan wore several hats. Joan and my mum were also friends through volunteering with our marching band and the local girl guides unit – needless to say, they were like extended family. Joan had noticed that although I couldn’t dive, I was an ok swimmer and had seen me as a ‘six’ leader in the brownies (the little groups in each unit), so suggested to my mum that I might be a good swim teacher. In those days, the local council ran the swim lessons. Instructors were volunteers and the lessons were free – can you imagine?? I’m not sure of the quality of my teaching then, but I really enjoyed it (even on the cold rainy days – it was an outdoor facility). One thing that stuck in my mind was how the kids parroted me, even after the lesson was finished and they were showing their parents what they had learned. It seemed strange to me at the time (I was 13 after all) that they didn’t get all that I’d shown them and they’d pretty much all got something different which meant the following week I’d have to do the same lesson again and then the next week and so on until they got all the points I was trying to convey. I could see it was getting boring towards the end of term, so I started to mix it up adding dance moves into the lesson. Thankfully, the kids were too young to know any dance moves because I was making it up on the spot, but they did all like thinking they were rockstars and very soon, their fake rockstar moves translated into forward propulsion in the water. After the Christmas break, I was in demand as a teacher despite being the youngest teacher there. I used to loathe our school swim carnivals – if only I could go back and do them now! This was my local pool growing up – we were so lucky to have such a nice facility. Derek Zoolander and his trademark pose “Blue Steel” – when I ask the guys to do this pose they almost always do it looking over their shoulder which is exactly what I want to help them achieve body rotation. I still use my rockstar moves although many have changed names from things like the “pop tree” to “rocket ship” when I work with kids or “streamline push off the wall” when I work with adults. 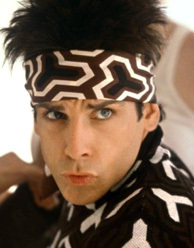 New ones that have stuck though are Michael Jackson’s ‘Moonwalk’ when I work on people’s kick and Madonna’s ‘Vogue’ and (to help the guys) Zoolander’s Blue Steel (pictured below) when working on body rotation and breathing. It makes sessions a lot of fun and with it brings marked progression in short timeframes for guys and girls! Now, all my sessions are tailored around my best offering to the group I have in front of me. I still write my lesson plans or drag out old ones, but I’ll pull aside different people at different times and get them to focus on an element of the set – i.e. reaching longer, moving their hips, timing of their breathing etc. Regardless of the set, something can always be added to it to improve their strokes, and they always get homework no matter what their age! Posted on March 6, 2013 by coachmcfi	• This entry was posted in Uncategorized and tagged blue steel, coaching, Madonna, Michael Jackson, moonwalking, swimming, Zoolander. Bookmark the permalink.